Anthony Joshua speaks out on potentially fighting British rival Tyson Fury. Joshua, 29, is looking for an opponent for his next scheduled fight date of April 13 at Wembley, with Fury a possible candidate. While it remains to be seen if the pair will meet in the ring in the spring, the 2012 Olympic gold medalist has renewed his desires to eventually fight ‘The Gypsy King’. ‘That would be massive. I would love to [fight Fury],’ Joshua said on the Graham Norton show. ‘The fight that Wilder and Fury had, I felt that Fury won. ‘It would be amazing to have two British heavyweights and we would be combining the belts up. ‘We’re the top three, so I would love to fight him. Even though he hasn’t got a belt, it’s still fighting one of the top three.’ Fury’s last outing was on December 1 in Los Angeles where he fought to a controversial draw against WBC world champion Deontay Wilder. Negotiations are currently ongoing between the pair regarding a rematch. 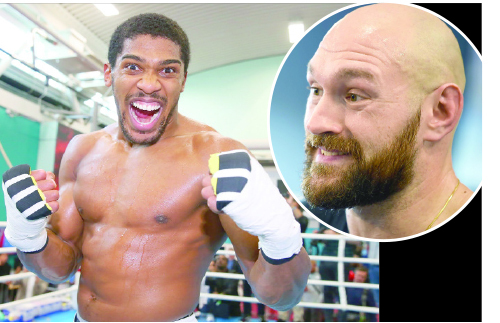 However, Fury could be lured into a fight with Joshua instead if the deal is right. Asked about Fury, he told The Graham Norton Show: “That would be massive. I would love to. “The fight that Wilder and Fury had, I felt that Fury won, so it would be amazing to have two British heavyweights and we would be combining the belts up. “In the eyes of a lot of people, Fury is a champion as such. “That’s a great offer, but he’s interested in fighting someone else, so I have to go a different route at the minute.